The running of the bulls is an enduring Spanish tradition and no UN resolution or UE regulation is able to bring it outside the law. Bulls will continue to run, men will die or get injured, while those surviving the experience will have one heck of a story to tell. 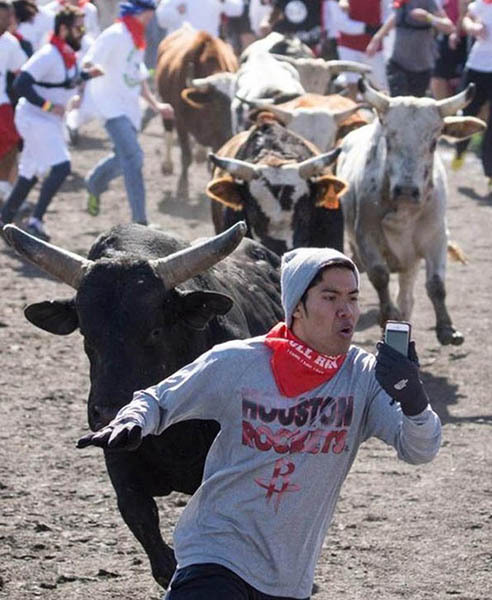 Nowadays, a story is nothing without a selfie and there is a growing trend of bull runners risking their odds just for the sake of a memorable pic. What everyone was expecting really happened in August 2015. A man was gored to death in the Spanish city of Pamplona. The 32-year-old David Lopez was foolish enough to leave the protected area and capture on film a feud between two bulls. Sick of running in vain, the animals sought revenge when they saw the man armed only with the latest iPhone in hands. We have reasons to believe the man died with a smile on his face. He had fulfilled a life’s goal by taking one of the best selfies ever. Unfortunately, the footage was confiscated and kept as evidence by the police.